The Supreme Court has asked Mayawati's counsel to file a separate appeal against the poll panel's order. 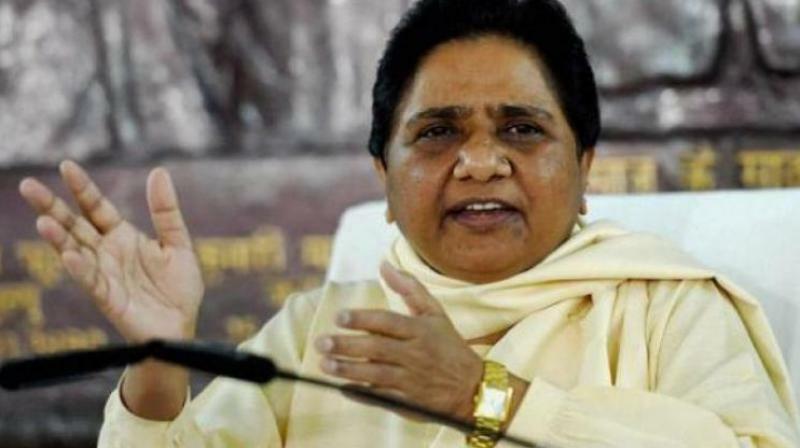 New Delhi: The Supreme Court on Tuesday refused to consider BSP supremo Mayawati's plea challenging the EC's 48-hr campaign ban on her and expressed satisfaction over the poll body's action against leaders making hate speeches. A bench headed by Chief Justice Ranjan Gogoi asked Mayawati's counsel to file a separate appeal against the poll panel's order. Taking note of the EC action, the court said it seems the poll body has "woken up" and barred various politicians from poll campaigning for varying hours. The bench also comprising Justice Sanjiv Khanna made it clear that no further order was required for now. The Election Commission on Monday imposed a nationwide campaign ban on Adityanath for 72 hours and on Union Minister Maneka Gandhi and Mayawati for 48 hours from Tuesday for their "provocative" communal remarks, which it said had the "propensity to polarise the elections". The all-India ban on all four leaders -- two from the ruling BJP and two from opposition parties -- came into force from 6 am Tuesday. While Adityanath, Mayawati and Gandhi were found guilty of violating the model code, the EC said Khan not only violated the poll code, he also disregarded its November 2013 directive asking politicians to desist from "deeds or actions construed as being repugnant to the honour and dignity of women". For the first time a pan-India ban has been imposed on politicians, while any restriction on a chief minister and a union minister is unprecedented. Mayawati alleged the order has been passed "under pressure" and it would be remembered as a "black day" in the EC's history. She has faced action for appealing to Muslims to not vote for the Congress to avoid their anti-BJP votes getting divided. Her alliance partner and SP chief Akhilesh Yadav asked the EC whether it is capable to issue similar directives to the prime minister to stop him from asking for votes in name of the Army. The EC order to bar Adityanath and Mayawati came soon after the Supreme Court asked the poll watchdog about the action it has initiated against them. The apex court had on Monday expressed displeasure over the Election Commission not taking quick action against politicians for communal and hate speeches during the Lok Sabha campaigning and decided to examine the ambit of its power following submission that it was "toothless". The bench had taken the cases of alleged communal speeches of Mayawati and Adityanath and asked the EC about the action taken so far against them while deciding to examine the statutory powers of poll panel to deal with the violation of model code of conduct (MCC). The EC's counsel had said: "The power of the EC in this behalf is very limited. We can issue notice and seek reply but we cannot de-recognise a party or disqualify a candidate...we can only issue advisories and in case of a repeat offence, register a complaint." Reacting sharply, the bench had said, "So you are basically saying you are toothless and powerless against hate speeches." It had then said that besides sending a notice, an advisory and a criminal case can be filed only against such leader. "It is stated by the counsel appearing for the EC that the power of the ECI for violation of the Model Code of Conduct by making hate speeches on grounds of religion, caste etc is circumscribed to issuing of notice and upon consideration of the reply to issue advisories. Only in case of repeated violation of the advisories, the EC has the power to file an FIR with the Police for initiation of criminal proceedings," the bench had noted in the order.